Out the back of our house is a small lean-to. It's back wall is the tin of the car shed, and it has a sloping tin roof, and two open sides. The closed in side is made of wooden slats, the ones pictured above. The sunlight streams through them throughout the day, creating pretty patterns on the bench beneath them. It's a small space with a concrete floor, opening out onto the backyard. It has an old rusted wood stove with a metal chimney in it (which we never use), a large box filled with wood for the inside fireplace (which we use all the time in winter) and to the left is our small pebbled herb garden. Squeezed into this little lean-to is also my potting area. The potting area is small, and the plants only get morning sunlight as the roof is made of tin. As a result the seedlings tend to grow on a lean, but I try to turn their little pots and trays around daily to keep them straight. We intend one day to replace some of the tin roof with that clear plastic roofing so that the seedlings can grow strong and tall but still be sheltered from heavy rain. It's not the most ideal area for raising seedlings, but it's the only spot I have and I've come to treasure it. It's a place of peace and quiet where I get to think and dream and imagine whilst I go about my work. 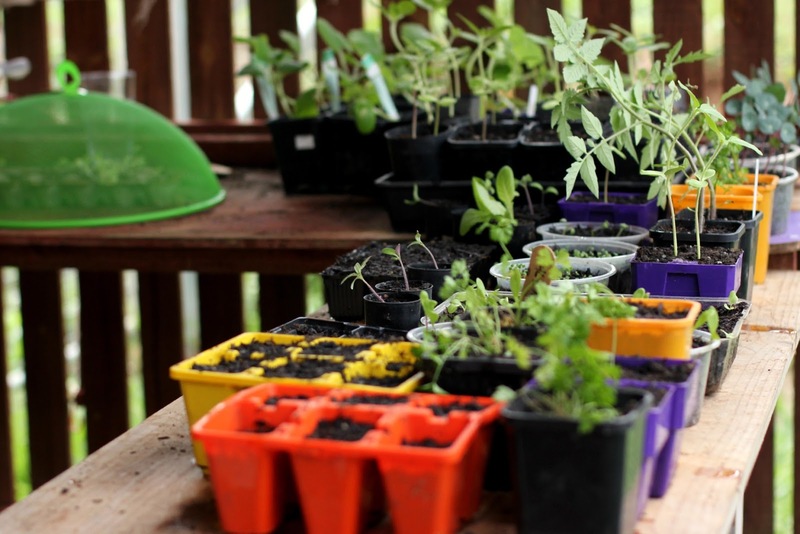 Here I spent hours poking seeds into trays and pots and punnets, thinking of the flowers and fruit and vegetables they will produce when they are planted into the veggie patch. 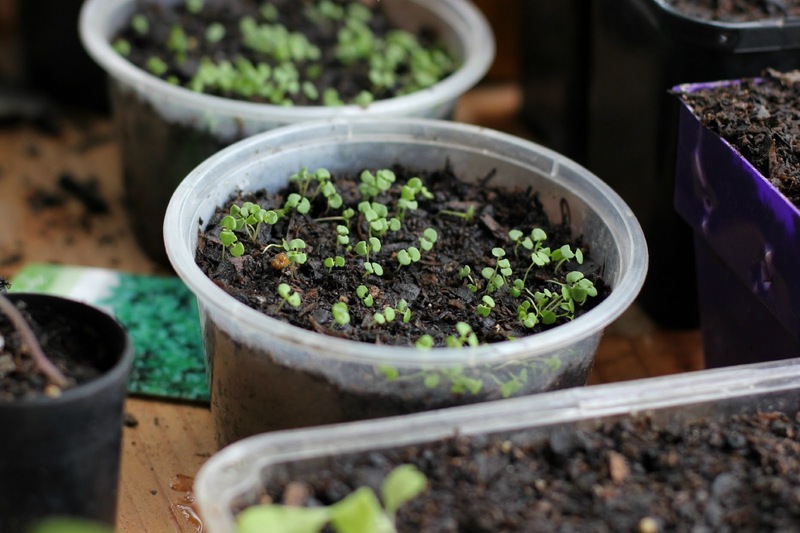 Here dreams and hopes come to life as little green shoots emerge from beneath the earth, and here they are sometimes shattered when whole trays of seedlings have to be tossed due to grub infestation*. Here I water, watch, wait and nurture tiny new plants until they are big and strong enough to be planted out into the garden. 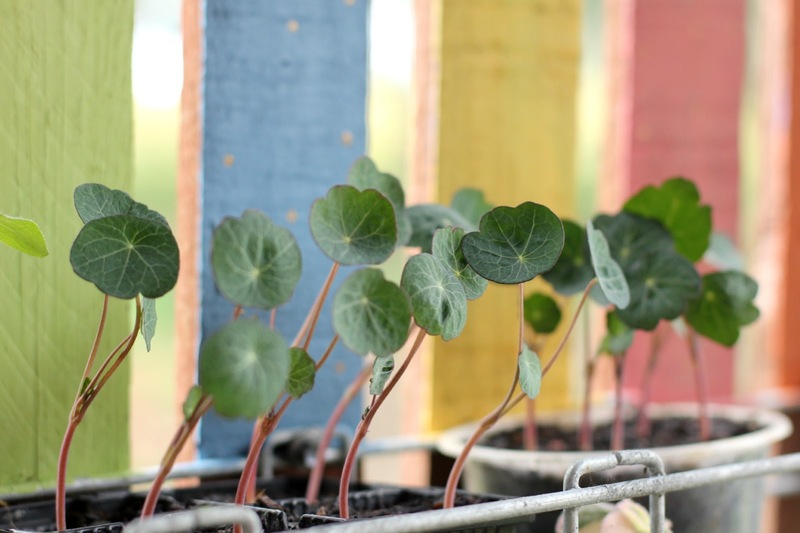 Here cuttings are taken, propagated, planted. Here things sometimes get forgotten about and shrivel before they get their feet into the garden. 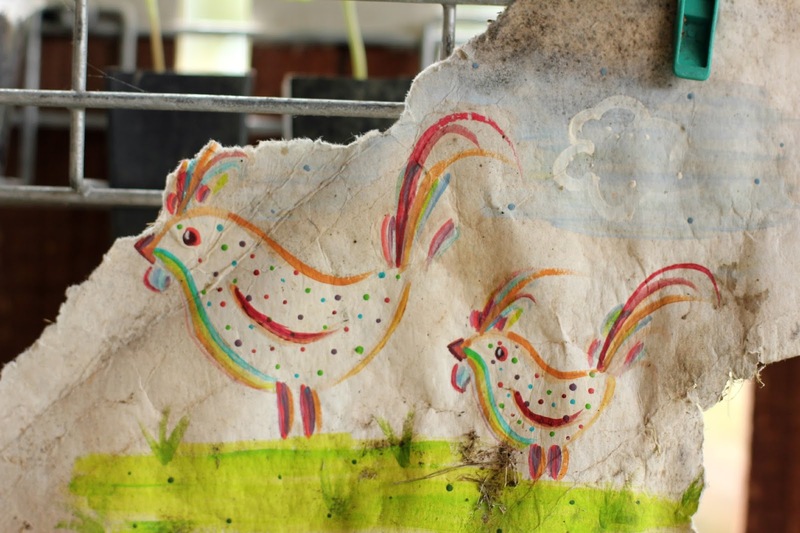 Here hangs a crumpled old sketch of two rainbow chickens my sister painted ages ago. 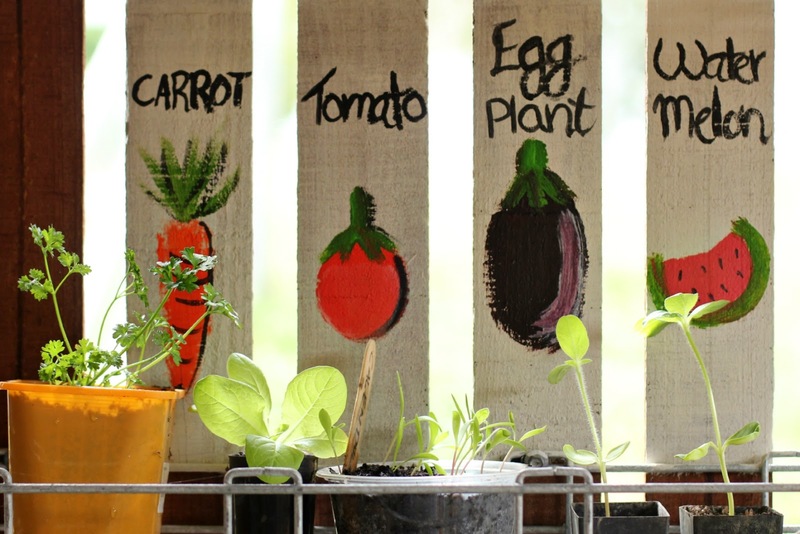 Here also are a few pastel panels and vegetable murals when an afternoon of creative craziness coincided with having the paint out. 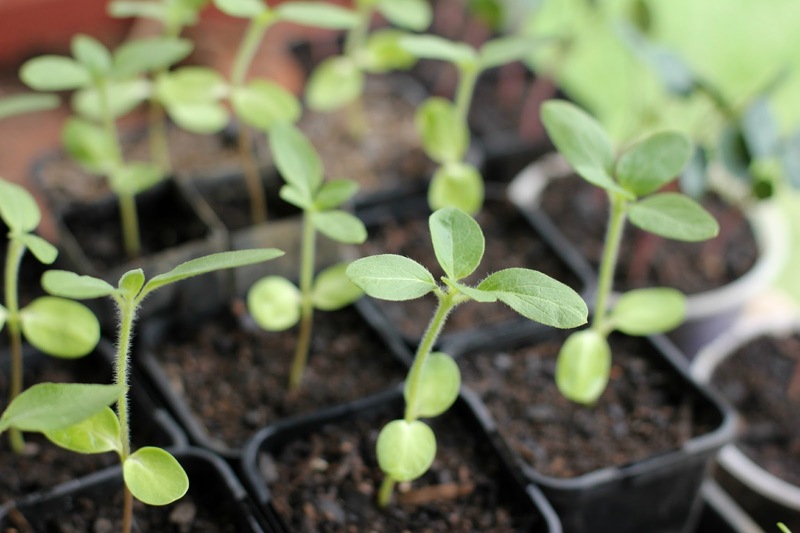 At the moment my potting area is filled with tall sunflower seedlings, tiny new thyme and sage shoots, trays of seeds that have been freshly planted and are yet to shoot, and many winter vegetables of different ages and stages. 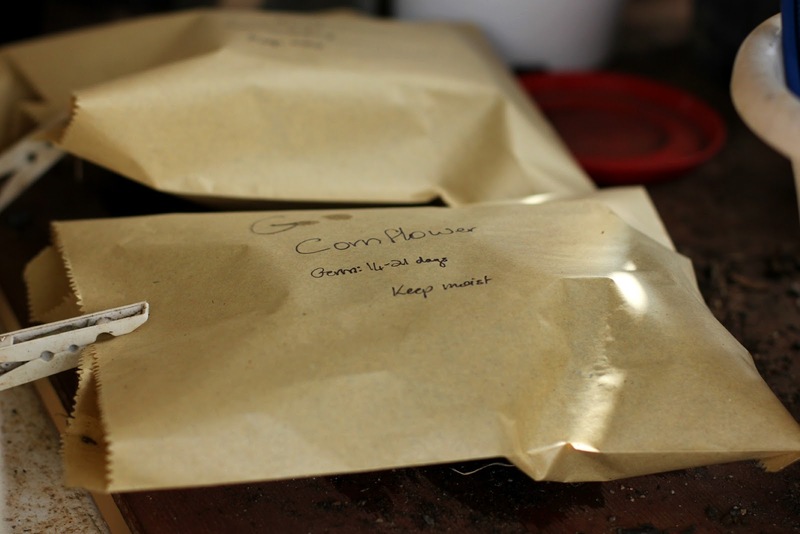 There are also some Cornflowers in their paper sacks - apparently they need darkness to germinate so I popped the two punnets into brown paper lunch bags and pegged the top shut. Despite the packet saying they took 14-21 days to germinate, mine shot within a couple of days. I removed them from their packet and placed them where they would receive some sun. I've never grown Cornflowers before but am quite enjoying them so far. Do you have a potting shed I wonder? Is it a large and roomy greenhouse or a small space like mine? 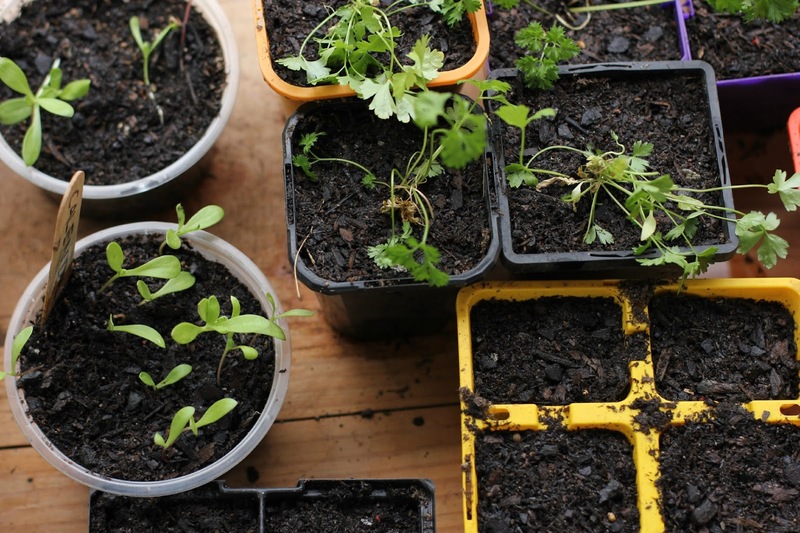 Do you plant seeds, seedlings or take cuttings? Have you any Cornflower growing tips for me? Enjoy the weekend, and welcome to a new month! *Fortunately I have managed to put an end to the seedling-tossing after purchasing some Grow Cover. It is a wonderful product and I highly recommend it**! I put such plants that are susceptible to grubs under it, such as kale, cabbage, chard, broccoli and cauliflower. I do love your little putting shed and the painted panels, especially the veg signs. I have grown cornflowers before and they are so easy. They were one of the first flowers that I grew when I got my own garden. I will say that you do need to remember to keep dead heading them or they will get very leggy and messy looking before you know it. Also if you put them in a spot of the garden that gets hit with the wind then you may need to stake them because they can grow quite tall.